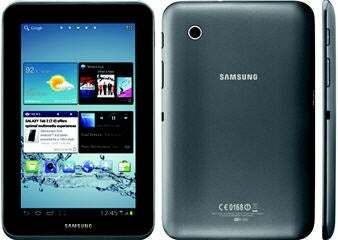 Samsung is entering the cheap Android tablet fray with the 7-inch Galaxy Tab 2, available April 22 for $250. The new tablet puts Samsung in close competition with Amazon's Kindle Fire and Barnes & Noble's Nook Tablet, which both cost $200. The Kindle Fire and Nook Tablet have earned plaudits for their simple interfaces, but they come at a price: Their app stores are limited in comparison with the Android Market, and they lack essential Google apps such as Gmail and Google Maps. The Galaxy Tab 2 has all those things, and runs Android 4.0, with support for widgets, multitasking and Google's Chrome browser. To reach a price of $250, Samsung had to make some compromises. The Tab 2 has a 1 GHz dual-core processor, a VGA front-facing camera and 8 GB of built-in storage. Last year's Galaxy Tab 7.0 Plus actually had better specs, and you can find refurbished models for under $300. If you wait a bit longer, you may even see more quad-core tablets entering the market. Asus, for instance, showed off a $250, 7-inch quad-core tablet at CES in January, but that product's fate is uncertain, with reports that Asus is working with Google on a cheaper tablet. Unlike some tablets like the iPad that require a separate IR dongle to control your entertainment center, Samsung's Galaxy Tab 2 has a built-in IR port, which you can program to work with your TV using the Peel Smart Remote app. Although some users may not like Samsung's TouchWiz interface on the Galaxy Tab 2, I'm more bothered by the amount of bloatware Samsung is loading onto the tablet. As Engadget points out, the Tab 2 has roughly 20 apps pre-installed, including Samsung MediaHub, ChatOn, Polaris Office, Amazon Kindle, Netflix and Samsung Apps. Some of those apps might be useful, but they should be opt-in, not included by default. The Galaxy Tab 2's inclusion of a MicroSD slot helps take the sting out of the measly 8 GB of storage on the device. With 16 GB MicroSD cards selling for about $5 on Amazon right now, you can add a lot of room for movies, music and photos for not much extra cash. You can get away with running blown-up smartphone apps on a 7-inch tablet, but it's not ideal. Android still doesn't have a lot of great tablet-optimized apps, so if that's what you're after, the iPad is still the only game in town.